Ask fellow campers about "Camping Le Rayon de Soleil" and nearby attractions. Convenient but the neighbors fire pit was literally directly under our pull out for the bed. We are still on Atlantic time so 11pm is like midnight for us!! They are talking loudly and small dog is sitting underneath our trailer barking on occasion. Don't stop here if u need a decent night sleep!! I can't believe how rude some people can be! Park should be out checking for that! 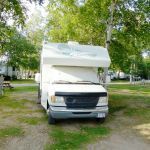 We camped at Camping Le Rayon de Soleil in a Fifth Wheel. Our site was a gravel/dirt pull-through that needed major leveling. Campground nicely landscaped with mature birch trees. All hookups worked fine. Never checked TV off antenna due to no English channels in area. Satellite reception not likely with all the trees around. Wi-Fi works, but internet access slow. Close to the autoroute, but not much noise heard. Would look for another campground with more level sites if in the area again. We camped at Camping Le Rayon de Soleil in a Motorhome. We were in a camper van and didn't get a serviced site. The pool is nice, but not heated. Playground available for the kids. We were in the back, don't know about WiFi but it wasn't available where we were camped. Just passing through, fine for the night. I wouldn't want to stay longer, too close to the highway and that noise for me. We camped at Camping Le Rayon de Soleil in a Motorhome. We stayed on two occasions this summer. It was a nice spot, near the highway so you're not far to be getting back on the road in the morning. The disadvantage is that there is a bit of road noise. My father-in-law stays there every year when travelling. The staff is friendly and helpful, the owner even guided me in to my site and level my tent trailer. We camped at Camping Le Rayon de Soleil in a Tent Trailer. Note that the directories list this as Camping Le Passant; they changed owners recently. Lots of trees, but room for a big rig to navigate. Very pleasant new owners. He rushed out to trim some tree limbs for me when it looked like they might scratch the rig at the dump station. Nice trail for walking the dog. Nice, quiet place. We camped at Camping Le Rayon de Soleil in a Motorhome. Are you affiliated with Camping Le Rayon de Soleil ?